Here at Adventure Assist our mission is to better connect travelers to their destinations. How are we doing that you ask? Well for starters, we launched the best travel notebook ever made. Yes, a physical notebook. I promise that we like apps and computers as much as anyone, but there really is just something special about writing things down by hand. In fact, science is on our side. Writing things down has been proven to help people achieve their goals, learn more, remember more, be more organized and be more productive. Google it if you don't believe us. You access more of your brain when you write things down. That brings us to our travel notebook -- a hybrid between travel planner and travel journal. It was designed for travelers, by travelers, with only the most relevant and useful sections included. We want to make it easier for you to access all of the information that you need while traveling. Also, the whole back section is a journal to note your ambitions, the things you've learned on your journey, and everything else you want to remember once you're back home. We want to help travelers better connect to their destinations. Did you learn any useful Spanish words from your trip throughout South America? How about the ancient history you learned about during your stay in Rome? Can you remember the name of your favorite restaurant that you went to in Paris? On your dream trip to Japan, did you make friends that you'd like to stay connected to? The Adventure Assist Travel Notebook helps you do all of this and more. 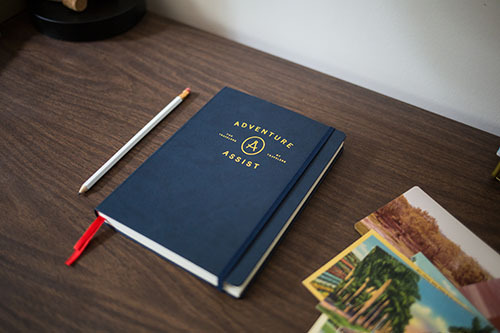 To get your own Adventure Assist Travel Notebook, head on over to our shop page.